Do you have old denim lying around? You can make it into something useful. 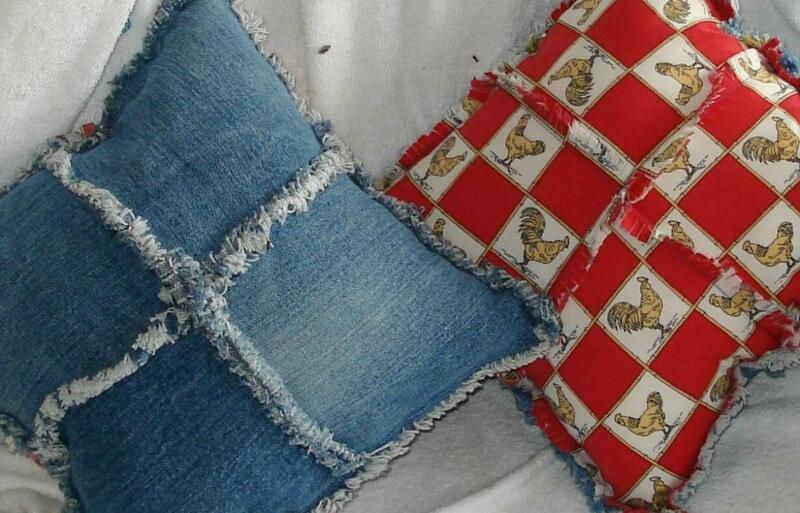 Here are fun ways to reuse your old denim. Potholders, rugs, quilts, and roses are just a few of the things you'll find here. Don't throw it out, reuse your old denim by making something that you can use! This denim throw rug is made by sewing small squares of denim to a backing. The finished product is a fun rug with lots of cushion, perfect for a teenager's bedroom, or lounge area. This adorable wall organizer is made from the cuff and leg of denim jeans. 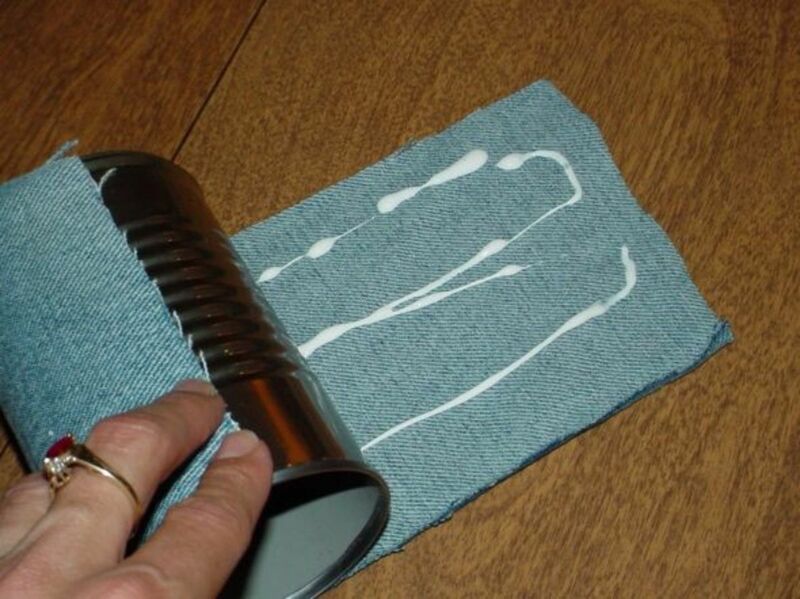 With a dowel rod, a sewing machine and a little creativity you can make this yourself at home. The contrasting stitching adds a lot of pizazz to the reused and useful denim art. Use it to store sewing and craft supplies, or organize just about anything in style with this cute and functional denim organizer. Because denim is heavy, it makes a great rug. I also like that denim is a purely natural fiber, being made from cotton. Frugal Veggie Mama gives a step by step tutorial of how to make these denim braids from old jeans and then shape them into a rug. I like the way she combined the various shades of denim. Read on to find out more about how you can reuse your favorite worn jeans to make a rug for you home! This adorable denim book cover is sure to be a big hit with teenage girls. It is made by reusing old jeans. It would be a great craft for personalizing a diary, photo album, calendar, bible, journal, or agenda before giving as a gift. The pocket was cut out keeping the backing in tact, so when it was glued to the cover, the pocket still opened, making a perfect hidden stash. 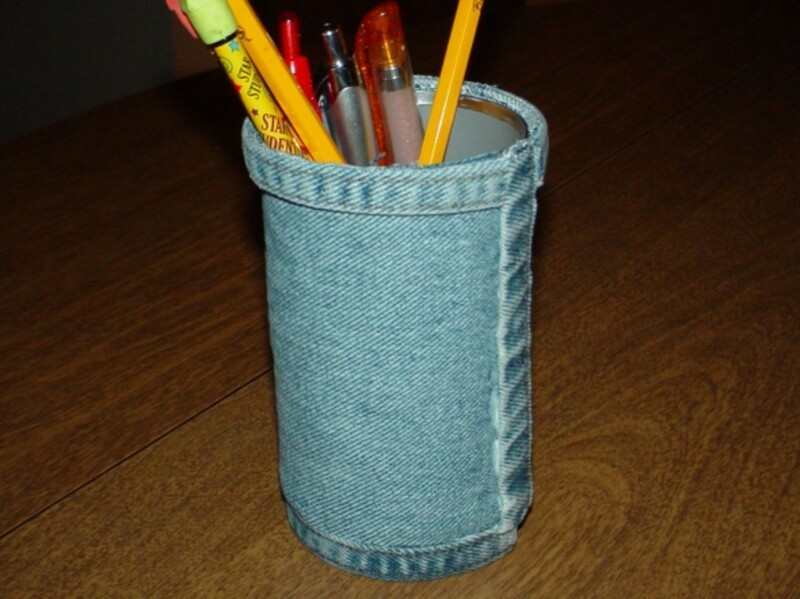 Denim crafts can grow on you quickly, because there are so many adorable ways to reuse it. 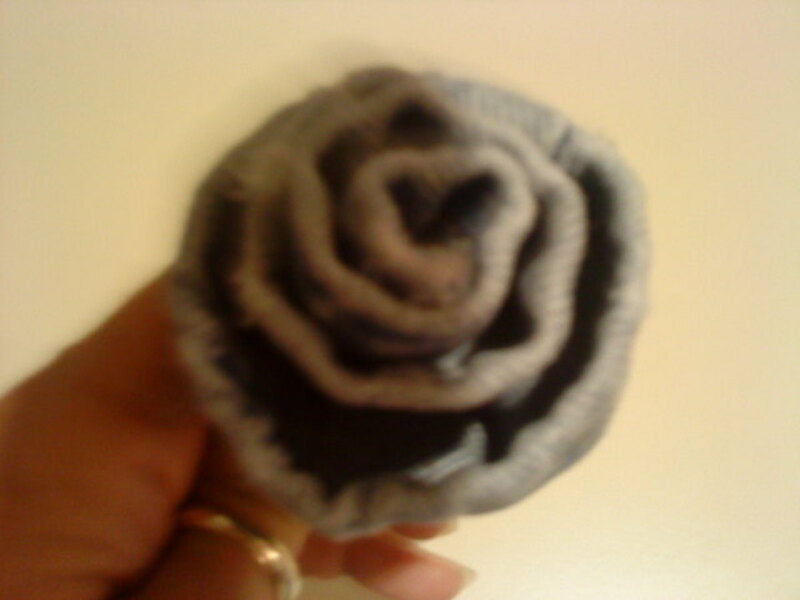 This denim rose is one more example of a way to reuse denim in crafts. This flower is a great way to embellish an otherwise plain denim project. Denim is such a wonderful material because it's made of natural fibers (cotton), yet it is heavy and warm. It's durability, warmth, and natural construction make it my all time favorite materials for constructing quilts from recycled fabric. You can make a quilt for your bed from your old jeans. 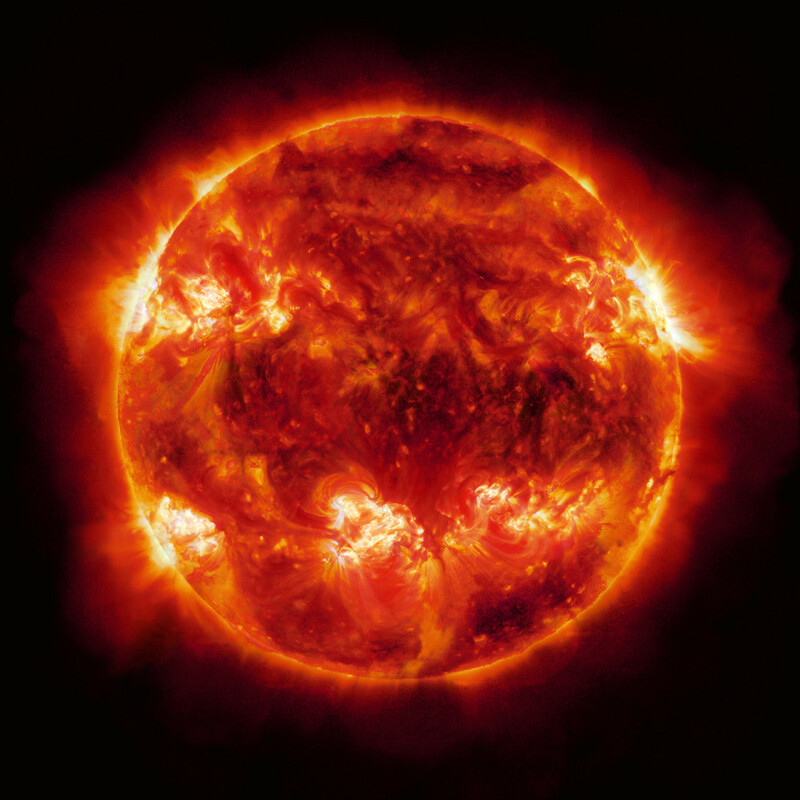 Not only is it eco-friendly, it's amazingly beautiful, creative and warm. 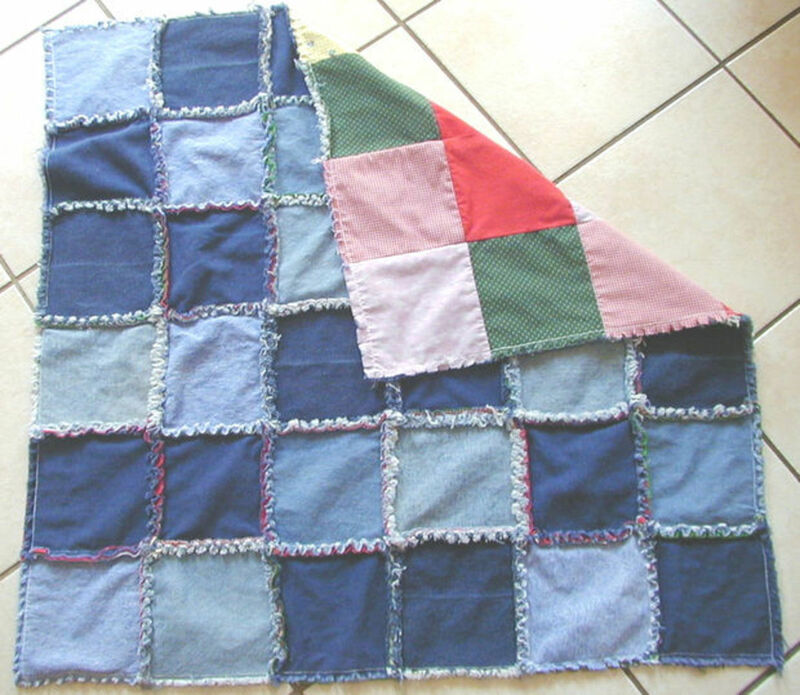 Here are several sets of instructions for making a quilt from recycled denim. These are not only adorable, they have so many possibilities. Upon first glance, you would think it's only a denim flower pot, but you can work this style into many other projects. How about decorating an Easter basket from a plastic bucket? Jazz up that flower you give mom on mother's day. 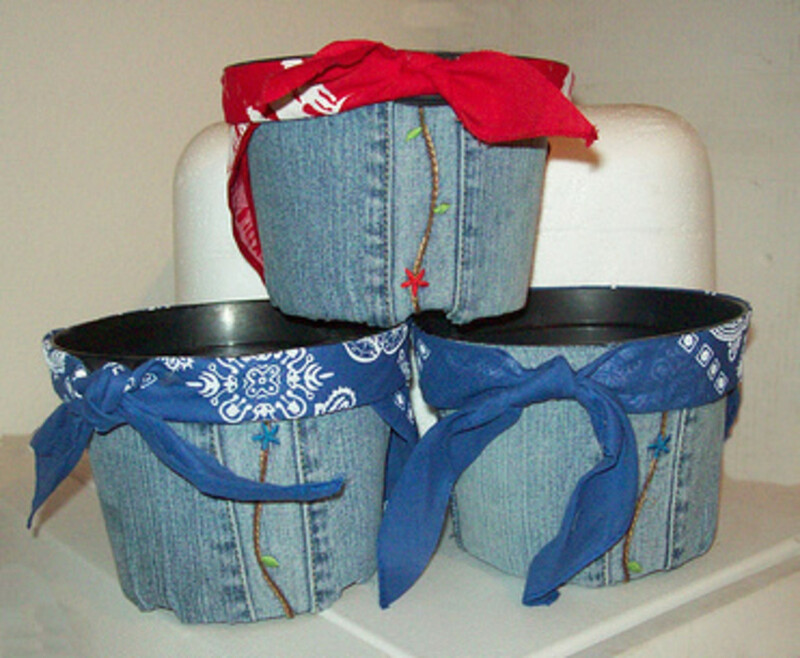 Create red, white and blue jeans Forth of July décor, or make a blue jeans gift basket for your next graduate. 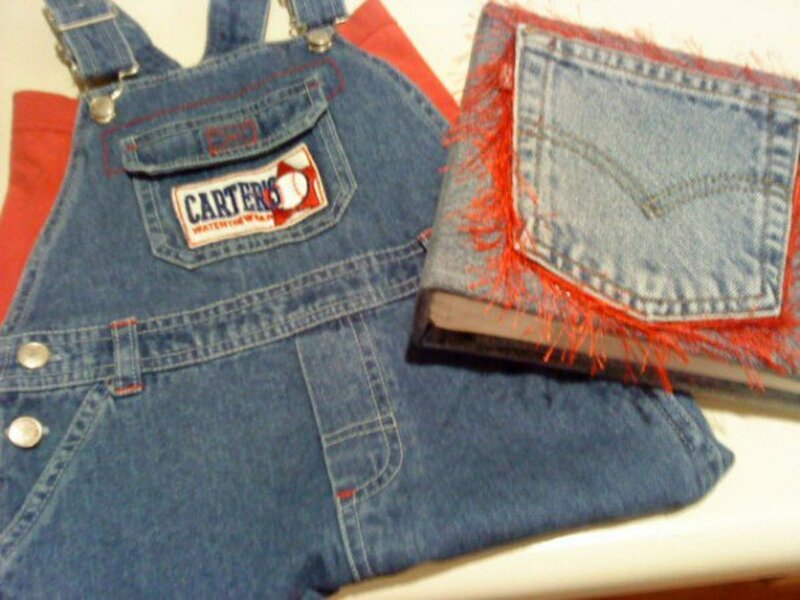 For more information on making these and other cool denim crafts, see Cindy's blog. 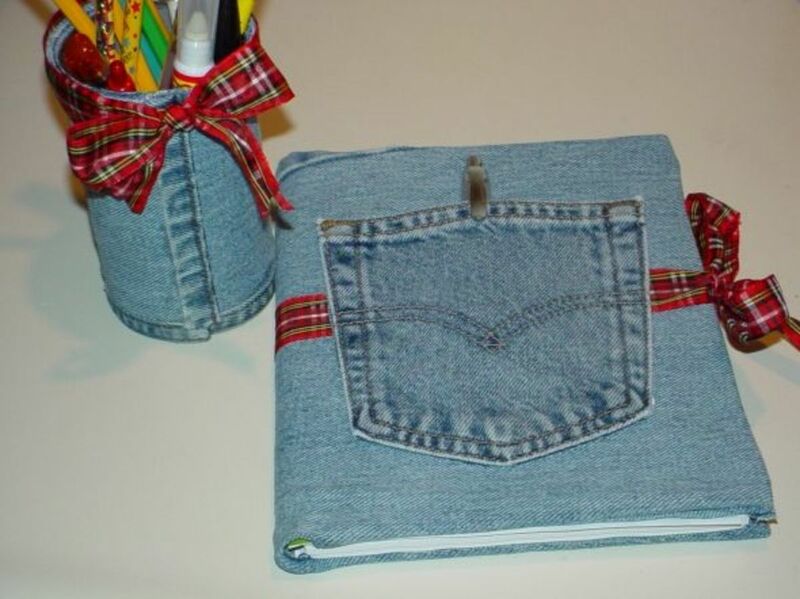 Gail Martin shows us how to use pockets from old blue jeans to make pocket organizers. Hang them on a locker, refrigerator, or anywhere a you could use a little extra organization. They are perfect for holding pens, pencils and pocket notebooks. Your teenagers will love these. The are also functional refrigerator magnets. You will never lose your pencil again. Thanks Gail! For Christmas this year, I made some pencil holder and journal sets from recycled materials. Everyone loved them, so I thought I'd post a photo of the sets here. I made the journal following the basic instructions for a book cover below. Before I attached the pocket, I ran the ribbon around the cover and glued it. 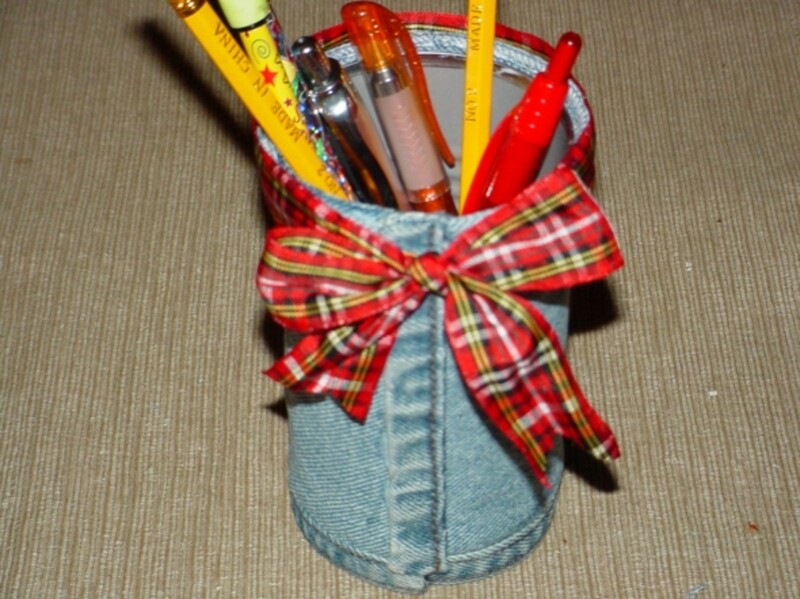 I used matching ribbon to wrap a bow around the pencil holder that is made from a soup can and repurposed old blue jeans. 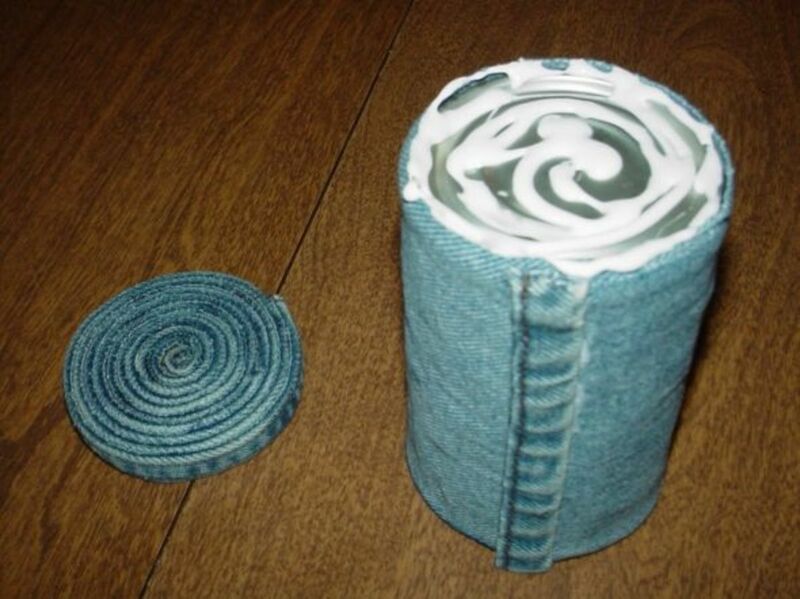 You can make spiraled circles from the hem of old jeans and use tacky glue to hold the spirals together. If you don't want to set a drink on them, stitch them together many combined would be an adorable rug or wall art. to make this little bank. It stores your coin and your cash with a little pocket embellishment. 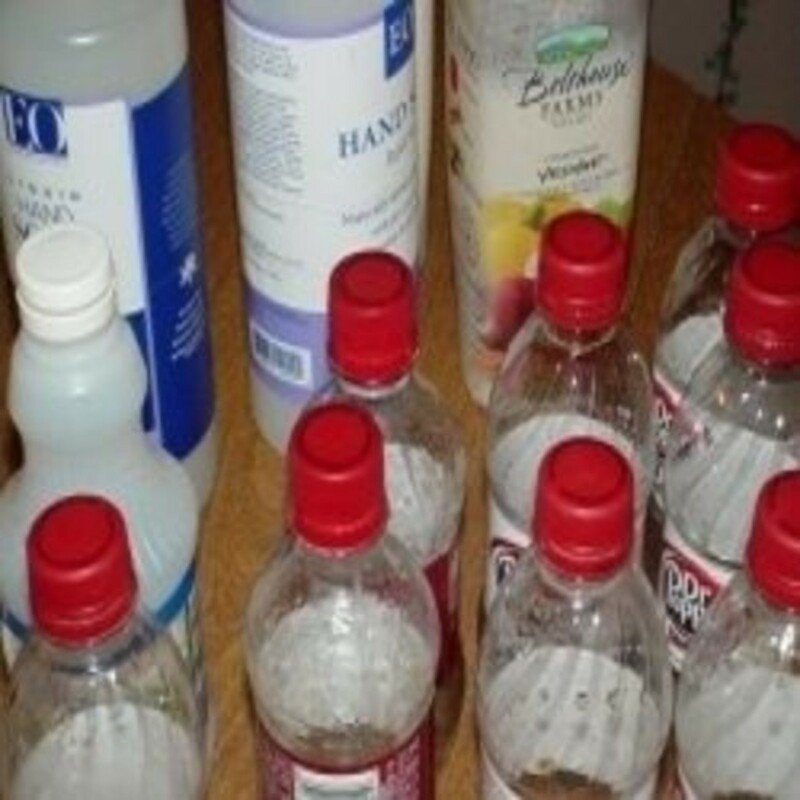 This is a great way for kids to get involved in creating recycled crafts. Were you wondering about a pillow? I was, so I Googled "how to make a denim pillow," and found these instructions from Sookie at Info Barrel. She has instructions for both the frayed denim pillow and the "tooth fairy" pillow with the pocket on the front. 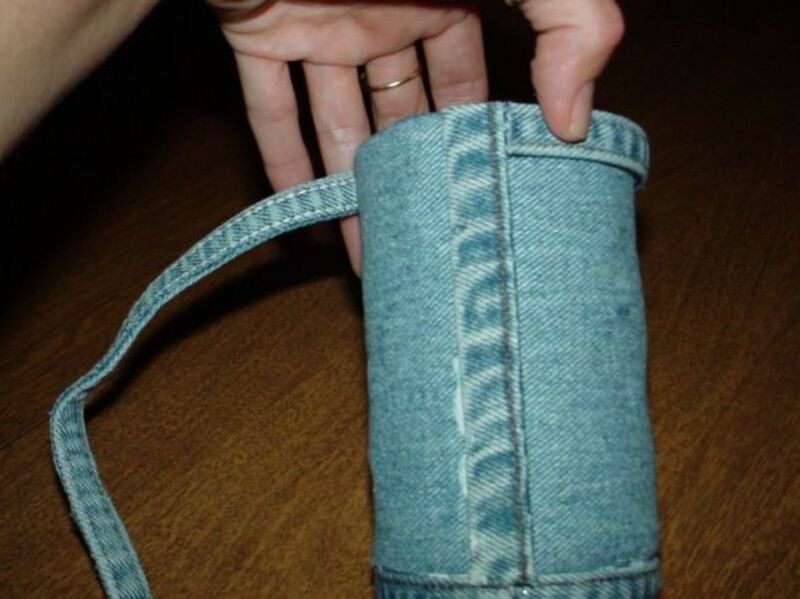 Another great way to reuse your old jeans! You asked for it, and here it is an oven mitt from reused denim. The denim is thick and heavy enough to keep heat away from the hands. Then its lined with more protective layers. It is a very practical reuse idea. 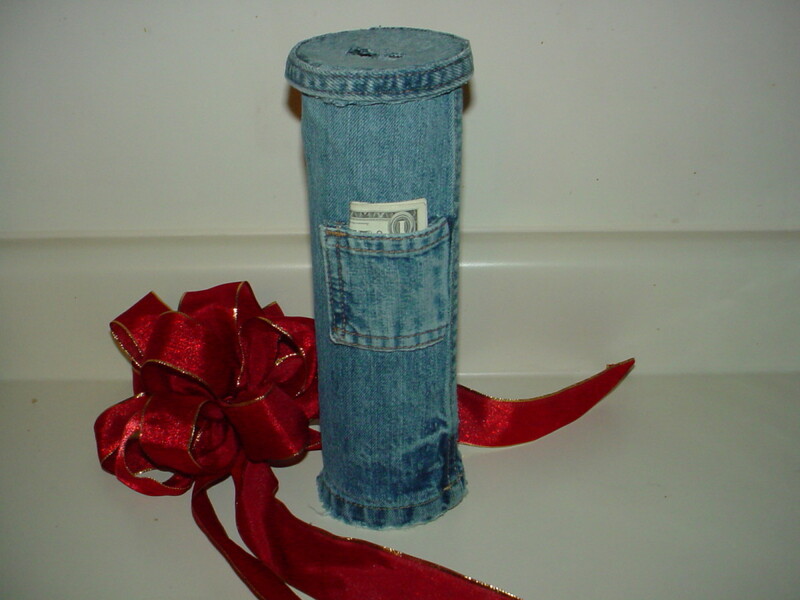 Over at the MyRecycledBags blog, they are always coming up with new ideas to reuse denim, so check it out. Add a magnet to the back of an old jeans pocket and you have a perfect organizer for your refrigerator. It holds pens, pencils and small notepads. They would make a great gift for high school girls to keep in their locker at school. I used magnets that had a self adhesive strips on them for attaching business cards, but you could tacky glue any magnet on to the pocket. How do YOU reuse Your Denim? I try to reuse it.... can't wait to try these crafts! Questions or Comments About Reusing Denim? - Leave them here! Great ideas. Very crafty and clever ideas to reuse old denim jeans. Voted up! Wow these are some great tips. I esp. like the oven mitt one. I have been saving my husbands Wranglers for years thinking that someday I would find a way to reuse the material. You can see my denim scarves at my shop markatkrafts on Etsy. They are so awesome, I;m really proud of them. Great ideas and tips, thanks for sharing! Some great ideas here. Thanks for sharing. Was on Pinterest looking for jean recycle ideas and started new board , then did google search and look who I found ------ HSS pinned your awesome squidoo lense. Miss seeing you round - our paths don't cross as much as they used to! Absolutely loved this article. I don't do many crafts, but maybe if I did I could justify watching TV! Most of these involve a sewing machine though. Ah, well - maybe I need to get a machine! Anyway - social bookmarked this awesome lens. I donate most of my old denim to Goodwill, but I may keep some. I love giving cash for gifts - the bank would make this classier and it looks like an easy craft. The rugs and quilt would become family heirlooms. Awesome article, I'm hoping to try the organizer soon! Thanks. These are really creative and frugal ways to recycle Denim. The potholder and pocket organizers sound fantastic! These ways of reusing denim are super cool! :O Amazing compilation! I always recycle my old denim, the last project I made was a denim lunch bag. Thanks for the potholder and coaster ideas! We reuse old denim to resharpen razor blades and that really extends the life of them. I've been reusing denim for years and you came up with projects that were new to me. Good job! We are all about recycle and reusing most anything. And now we have some great ideas about how to recycle and reuse my favorite color in jeans, the blue jeans. Awesome page. I made a quilt using denim blocks that my late mother created using machine embroidery. It's a great memory piece. Great ideas! The blue jean quilts are so pretty, but so are all these projects! What great ideas! I usually turn my old jeans into rags for dusting but now I can't wait to give some of your craft ideas a try. I really liked the magnets and pillows. Great crafty lens! I like some of these ideas to try with my girls... what a fun way to recycle! Cool lens! I've got plenty of old jeans I can use for this stuff. Nice ideas on this lens... gonna have to try 'em out. Wish I would've seen this before I got rid of some old jeans last week. Oh well, now I know! 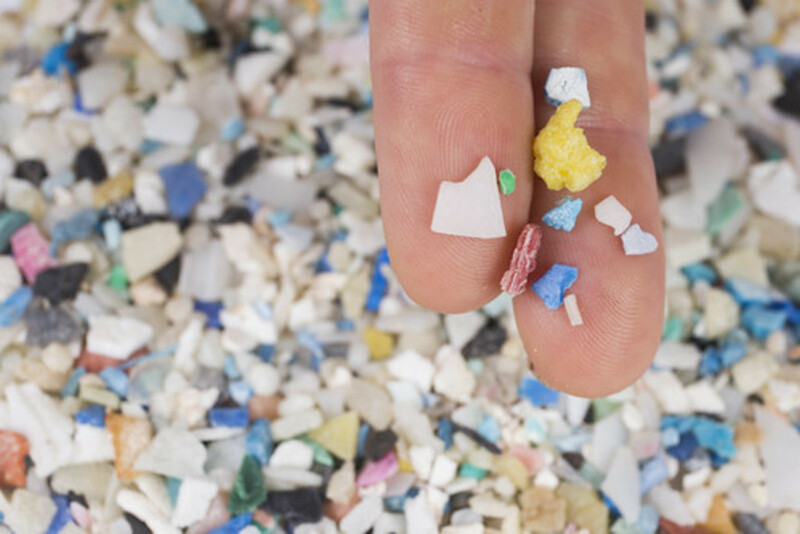 Super great ideas that make us think about just tossing items away. Great lens. Cool!!! Like this a lot..
You can use the hems to make dog toys too. 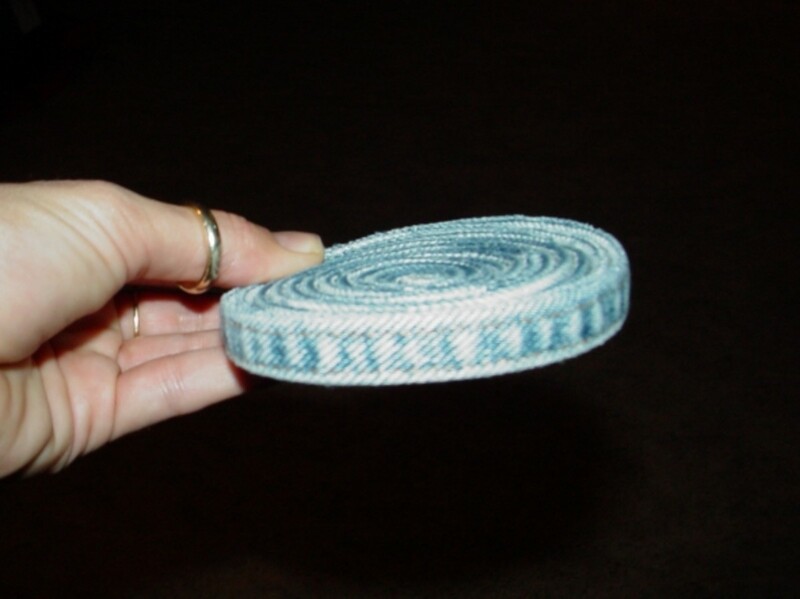 Braid three or more together and voila a nice denim rope toy! 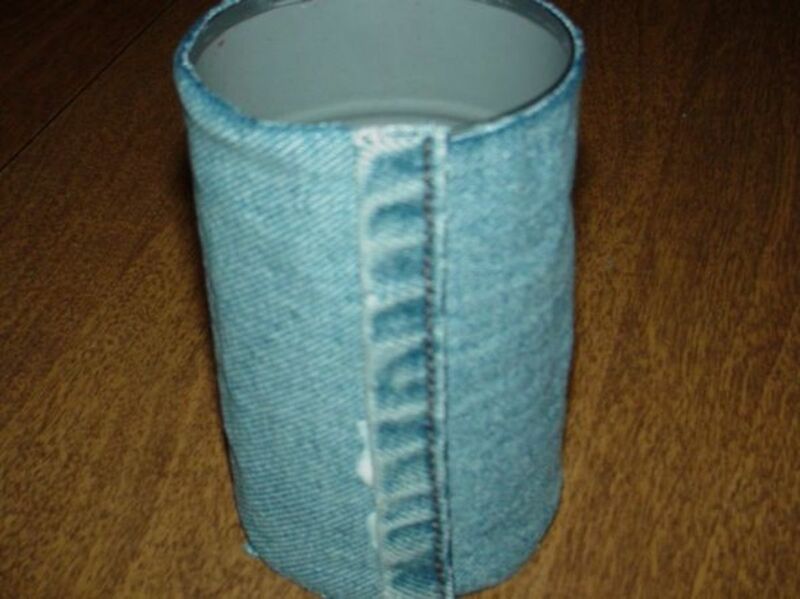 Sew 2 denim pockets together add stuffing and a squeaker velcro the top and you have a durable dog toy. 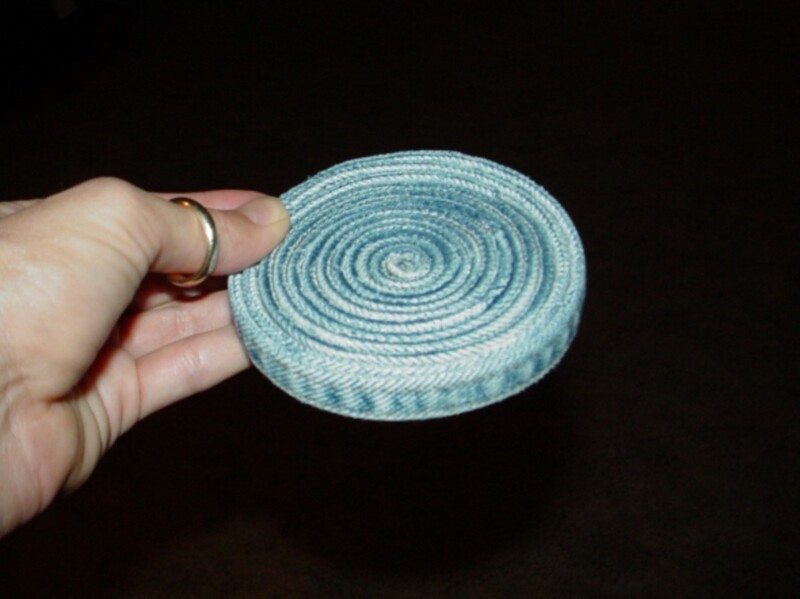 I love the coasters made from denim hems! I've reused my old denim for years, but the hems are often hard to find a use for. Awesome! I will have to try the organizer. Thanks for all the ideas. Awesome article - love the denim rug and coasters!! Congrats on making the upcycling monsterboard! I like that potholder idea......I have some jeans I was going to put out in the yard sale, now I think I will try to see what I can do with them instead. Love the braided rugs and pocket organizers - bravo! Awesome lens with awesome ideas! This is great... My daughter has so many torn up and jeans that don't fit. These are must projects! Thanks! Good ideas, I never throw anything out. Guess I'll have to learn how to sew. What a delightful and fun lens! I love to re-purpose denim, I cut denim into small pieces to use as a buffing cloth for polishing polymer clay beads that I create. It works beautifully and I never run out! I've got one of those denim book covers. I also have a keychain that is a small denim pocket (two pockets from kids jeans sewn together). I can keep a couple bucks tucked down into it in case I need it in a pinch. Also, I have some recycled denim pencils. They are made with compressed denim rather than wood. Seems I'm going to be making a denim organizer! There are a few pairs of jeans around the house with non-functioning zippers and holes that would be difficult to repair. Thanks for the lens. You can buy used jeans on flee market and second hand shops to make stuff! Super craft ideas - the denim bank is one I've never seen before. Adding to my Recycling lenses! I like the different items you made out of denim. Teens would love this in their room and i would love to have one of those organizers. "High Five" I like your ideas. Very creative! I will definitely try it at home since I've been wondering how to improve my old jeans. All ideas are great, but Refrigerator Pocket Organizers... This is brilliant! I am going to cut my old jeans right now! HI, I've made a lense about making bags out of jeans, you can check it on http://www.squidoo.com/making-bags-in-the-classroo... I hope you like it. I really like your ideas. We shouldn't throw clothes away. I love your ideas for reusing denim! Thanks! Blessed! I really like the woven or braided rug idea! I always cut my worn jeans into shorts, but the way they sell jeans now I would be better served to keep wearing them, holes and all. Wonderful ideas and very attractive. I love the rugs. You have no idea how happy I am to have stumbled into this lens! I've got a basket filled with tattered clothes that need repurposing and I was lacking serious inspiration. I was even tempted to throw it all out but I just couldn't bring myself to trash good material. lol! Like my mother says, "But the rest of it's still good!" Great ideas on this lens. Makes me want to save all our old denim. 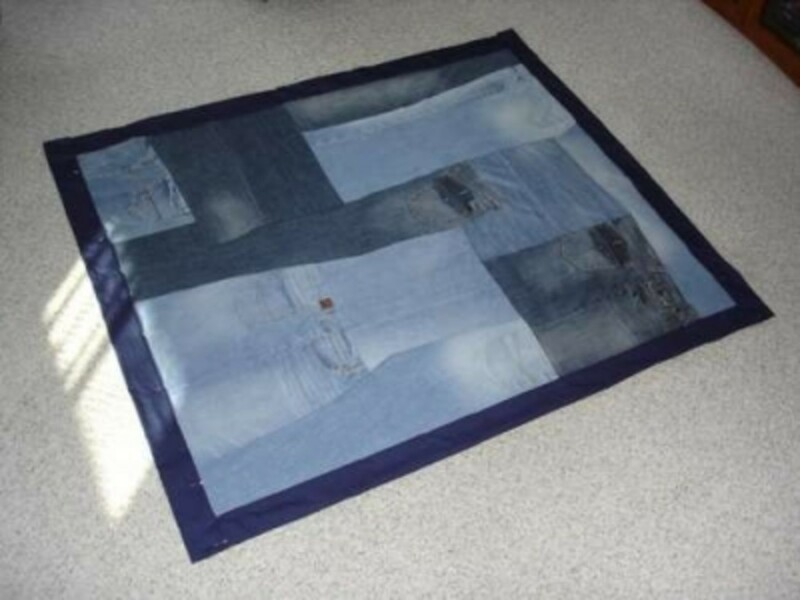 Years ago I made my teenage son a denim quilt for his bed with blue and black old jeans. He loved it. Excellent reuse of Denim jeans. Super like. I love durable denim - and these are beautiful brilliant ideas. Great lens!!! Love the scatter rugs! Terrific lens. I normally donate my denim to a thrift store. However, I am in love with those coasters. I will have to make some soon. Very creative! Love this lens - lots of great ideas! Excellent lens, I love these ideas. When I was a teen, my mom made me a pieced denim quilt from old jeans and I loved it! I want to try the denim rug for my boys' room and the coasters for my kitchen. Cool ideas! These are fab ideas. I particularly love the bookcovers and coasters. Some of the others require just a little bit too much denim! I'm now going to go through some of my old clothes and see what can be recycled! Just blessed this a while back and had to return to congratulate you on front page honors! 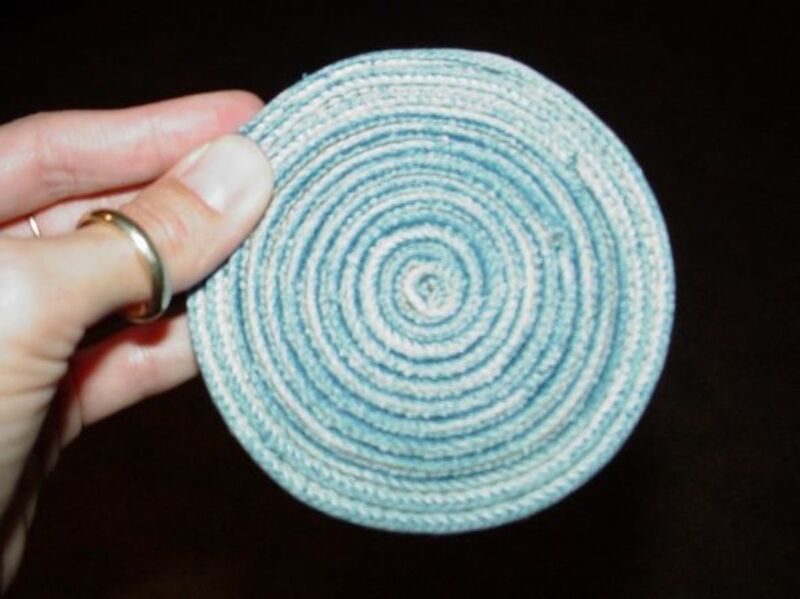 I used to weave rag rugs from recycled denim. I've also made tote bags from old jeans. Those are some neat ideas. i'm afraid I haven't got as far yet as deciding which denim needs to be recycled. You can take strips and weave them into denim rugs. Looks great and is really sturdy. Lots of great ideas! Jeans work good for insulation too! I love the square jean quilt! The coasters are kind of neat also. I used to just cut them up and use them as rags. Now I see there are more things I can do with them. Now I know what to do with all those old jeans! Great lens! !